BETHLEHEM (Ma’an) — Israeli Prime Minister Benjamin Netanyahu promised his far-right government on Sunday that he would lift all restrictions on settlement construction in occupied East Jerusalem, Israeli media reported. 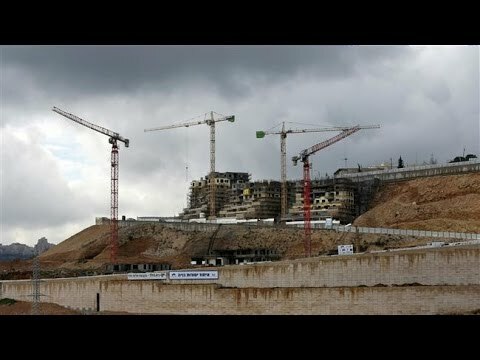 Netanyahu’s announcement came as Israel’s Jerusalem municipality approved permits for the construction of at least 566 new illegal Israeli settlement units in occupied East Jerusalem on Sunday, after the plans were said to be put on hold until after US President Donald Trump was sworn in. A spokesperson for the municipality told Ma’an that the Local Building and Planning Committee in Jerusalem approved the construction of 671 housing units in a number of areas, after their approval was delayed for several weeks. The spokesperson said that 324 units were approved in the Ramot settlement, 174 units in the Ramat Shlomo settlement, and 68 units in the Pisgat Zeev settlement. She also listed a number of new construction to be greenlit in various Palestinian neighborhoods in occupied East Jerusalem, including 49 units in Beit Hanina, 14 units in Wadi Joz, 24 units in Umm Lisun and Umm Tuba, seven units Jabal al-Mukabbir, four units in Beit Safafa, three units in Sur Bahir, and four units in al-Tur. It remained unclear as of Monday morning whether the newly approved construction in the Palestinian neighborhoods would be for the purpose of Jewish-only settlements. A representative from the Applied Research Institute Jerusalem – (ARIJ) told Ma’an that their organization was investigating the municipality’s approvals. According to Israeli newspaper Haaretz, Netanyahu’s pledge to ramp up East Jerusalem settlement expansion was a major factor in convincing Israeli ministers to hold off from voting on a bill calling for the annexation of the occupied West Bank settlement of Maale Adumim to Israel. Netanyahu’s pressure on the annexation bill, as well as the retraction of his support for a bill that would retroactively legalize dozens of illegal Israeli settlement outposts, is reported to be the result of pressures from Trump’s newly instated administration. While Trump is a vocal supporter of Israel and its settlement expansion — a policy which is deemed illegal under international law — the American head of state’s advisers reportedly urged that “no unilateral steps should be taken by Israel” until a meeting was held between Netanyahu and Trump sometime in February. Netanyahu nonetheless told the Israeli security cabinet that he supported the annexation of Maale Adumim as well as Israeli sovereignty over all other settlements in the occupied Palestinian territory, and that he planned to advance settlement building in the West Bank, Haaretz reported. His statement reiterating the Israeli government’s refusal to negotiate a proper two-state solution came as Chinese President Xi Jinping called on Thursday for the establishment of a Palestinian state along 1967 borders with East Jerusalem as its capital, as he announced the disbursement of $7.6 million in aid for Palestinians. Calls to annex Maale Adumim and to annex a majority of the occupied West Bank have gained momentum among reactionary Israeli lawmakers and ministers following the passage of UN Resolution 2334.